Since summer of 2013, when I was nine years old, I have been to Italy three times. My parents and I have traveled together each trip, but this time, when we went in the beginning of August, it was just my mom and me. This opened up an entirely new line of possibilities and places to travel to, but after deciding on Italy, we thought Lake Como and Milan would be two good places to explore on our first mother-daughter trip. Lake Como is located in the region of Lombardy and is an extremely well known place to go, as it houses many famous stars, such as George Clooney and Madonna. Como has many different towns to stop at all over the lake, which is fun for everyone. 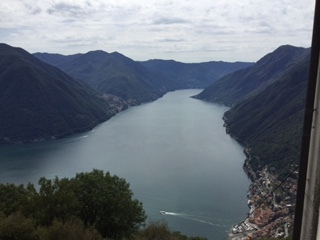 After our flight landed in Milan on Wednesday, August 9, we took a taxi to Lake Como. The town that we stayed in is called Cernobbio, and I recommend staying in this area if you are traveling with a big family. There are lots of things to do, and it isn’t insanely crowded; plus, the ferry station is right in the middle of town, so you can’t miss it, and the boats come very often. Although we didn’t stay in a hotel but rather an apartment, there are many different hotels in Cernobbio that are beautiful, easy to get to, and worth staying at any day. My favorite place to visit for a drink or a gelato is the Villa D’este, located a mile out of town. It is really one of the most beautiful places I have ever visited, and although very pricey, it is worth every penny. Just keep in mind that you DO have to contact them first if you want to visit and are not staying at the hotel. And it is an easy walk into town with shops and restaurants (and taxis!) along the way. Another beautiful hotel to keep in mind is the Villa Serbelloni, which isn’t located in Cernobbio but rather Bellagio. Bellagio is likely the most famous town on the lake (other than Como) with tons of things to buy, places to go, and things to eat. Unlike Villa D’este, the Villa Serbelloni usually lets anyone into their terrace coffee bar, which overlooks all of Lake Como and the hotel’s big lap pool. Highly recommended! Our first day on Lake Como was spent exploring Cernobbio and the town of Moltrasio. In Cernobbio, we mostly just walked around and noticed the different restaurants along the streets. Since we spent our trip in an apartment, we didn’t need to eat out for every meal, so it was nice to buy food from local stores. My favorite specialty is taleggio, a brie-like cheese, which melts in your mouth and has a very distinctive flavor. The best restaurant in Cernobbio in my opinion is either La Sosta, located up the mountain, which serves pizza, pasta, homemade tiramisu, and other fabulous Italian dishes, or Trattoria Laghee, which is right in town, easy to get to, and has the most delicious mushroom risotto! They can even make it without butter if you are dairy-free, and there are plenty of pastas, pizzas, and other delicious dishes for reasonable rates. After walking around Cernobbio and finding the Villa D’este, we took a ferry to Moltrasio, which is the next town over, and a very easy boat ride. Moltrasio is a very adorable town, but truthfully, there isn’t much there to do. One hotel, one restaurant… you get the picture. But my mom and I loved walking around and spotting different Roman fountains, streams, homes, etc. One of our favorite memories of the trip was roaming around and finding a whole bunch of cute little creeks and waterfalls. One is certainly able to wade in it, so that’s just what we did! The water was cool and refreshing, and afterwards we enjoyed a quick snack of fresh tiramisu in town before taking the ferry back to Cernobbio. The next day was a very long day, where we explored two of the most famous towns on the lake—Bellagio and Varenna. Like I said before, Bellagio is the top tourist trap, and Varenna is, too, but in a different way. It is just so picturesque, so beautiful, that you forget the hoards of tourists around you. When we arrived at about 12:30 in the afternoon, there was an accordion player on the street playing Old Italian tunes while children roamed the beach and WE searched for a place to eat lunch at. One of the best meals of the trip came in Varenna, where we settled down to a delicious lunch at an adorable little restaurant serving nothing but local specialties. My mom and I enjoyed the most delicious lake fish ravioli with cream sauce. We will never forget how good it was, melting in our mouths! Heavenly. After grabbing a cone of straciatella (chocolate chip) at a gelateria along the way, we took a ferry from Varenna, sad to not swim (or eat more lunch! ), but it was time to go to Bellagio. Bellagio is big, hot, loud, crowded, and hard to go to. Many tourists in the area feel obligated to go as it is a very well-known town, but quite frankly, my mom and I would have been much happier just staying in Varenna. Okay, so Bellagio has some nice stores and a few restaurants. It’s not necessary to visit in my opinion, and we didn’t really do much once we arrived—just stopped at Villa Serbelloni for a quick coffee, window shopped, and were out of there. The next trip a few days later was to Isola Comacina, which is actually the only island on the entire lake. Its picturesque beach, mountain views, and lovely hikes will make for a very fun day. My mom and I immediately ran to the beach, as in August it gets very toasty some days, and hopped into the sparkling aqua water surrounding the Italian pre-Alps (the smaller mountain chain in front of the snow-capped, huge Alps farther away). The view is just spectacular, and swimming at Isola Comacina’s beach was one of my favorite activities all trip. Just to keep in mind, though, it is very rocky, and I stubbed my toes many times walking across the shore! After a delightful swim, we made our way back to the road and hiked around the whole island, stopping to view Isola Comacina’s only church (perched high atop the island) and some ruins next to it. We took many great photos along the way. And just so you know, there is one large restaurant on the island, but it is very expensive, and we chose to eat at the small bar next to the boat stop instead, which offers water, coffee, chips, ice cream, and sandwiches instead of heavy, large pre-fixed meals. Our next stop was to the town of Torno, which we liked so much we visited twice. It is very small and incredibly adorable. It has tons of angled and cobblestoned side streets and little homes overlooking the lake, plus the most fantastic restaurant! When you get off the boat, two things are facing you: a fancy restaurant and a small café. We chose to sample both and loved them! The restaurant is wonderful, with amazing views of the lake and fabulous homemade pasta and gelato. The bar offers a wide selection of chips and smoothies. 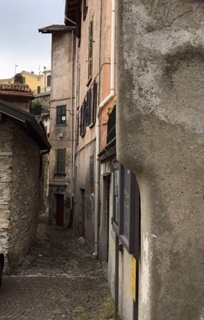 Torno, I would say, is not to be missed—with its many medieval-looking streets, it’s just so fun to explore the town. At the end of our day there, I even found a tiny, overgrown path that actually stopped at the very top of the mountain! It would have been fun to check out, but way too far. If you want to avoid tourists and stay here, I believe there is at least one hotel above the restaurant. One of our last days on Lake Como was spent in the town of Argegno, which is a wonderful little place with many things to do. Our first activity was taking a funicular up to the top of the mountain, where a tiny town called Pigra stands. Pigra is very, very high up, so if you are afraid of heights, I don’t recommend visiting. But if you are not, it’s really fun to explore! We walked around and had lunch at the only restaurant in town, then just took in the marvelous view. Once my mom and I had our share of the village of Pigra, it was time to explore Argegno. The main thing we did there was go to the main attraction—Argegno’s pool and beach (Lido di Argegno). 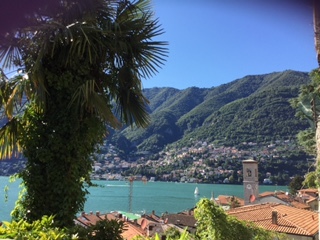 It is beautiful, overlooking the lake and the mountains, and we had a great time relaxing and eating some yummy gelato and sorbet at the pool’s bar. Argegno is a fun, little town, and it’s nice to relax, swimming in either the cold pool or warm lake. It was a great last day and will be remembered for a long time. Our last day in Italy was spent in Milan. We took a commuter train from Como’s station, and it actually only took about an hour. When we arrived, we went to our hotel, the Cristofaro Colombo International World Hotel. It is located right in the center of the city, across from many restaurants and attractions. The hotel was really nice—not too pricey and very elegant—and I definitely recommend it. As we only had one day to explore the city, we quickly decided to hop in a taxi and go straight to Il Duomo, one of the most fabulous pieces of architecture in the world. It was amazing—and my mom and I took tons of photos. But it was insanely crowded and horribly hot! That was the one thing we were not crazy about, and it ruined part of the day, as we could barely move around without being hoarded by tourists. 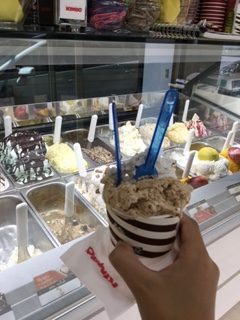 After seeing Il Duomo, we got our last gelato of the trip and a bite to eat (bruschetta—tomato bread—and grilled zucchini) at a little restaurant in the Galleria, a beautiful covered shopping area with stores by world-famous designers. We then went back to our room till dinner. The very last meal of our trip was the best meal I’ve ever had by far. The restaurant, Osteria Mamma Rossa, was beautiful and old-world, with candle-lit tables and complimentary champagne and appetizers. And the food—we ordered Chilean sea bass with potatoes and a homemade pasta with a light cream sauce and fresh porcini mushrooms. The chef would even come around with his big hat and apron and check how everything was running. And for dessert—my mom and I shared pistachio mousse with fresh nuts on top. It was divine—and I’ll never forget it. So all in all, we had a fantastic trip. And I hope this helps if YOU are planning a trip to Lake Como. Stella, you are making me hungry! Pasta in cream sauce and porcini mushrooms! Pistachio mousse! It all sounds delicious. Too bad your dad didn’t go with you this time–he sure would have loved it all, especially the coffee! You are a fine writer: you make the places you visited come to life! I hope you keep on traveling and keep on writing!